What Is the Legal Drinking Age in France and Paris? 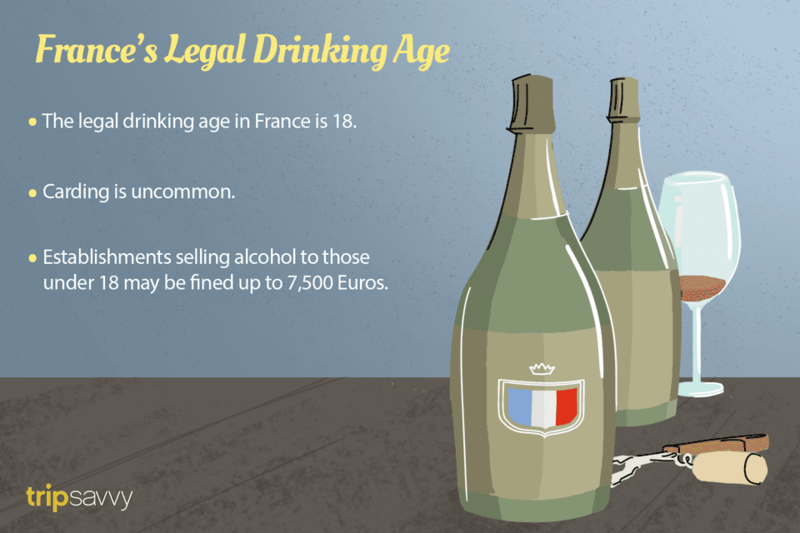 What Is The Legal Drinking Age in Paris and France? As a young adult visiting France or the French capital, you may be wondering whether you're old enough to drink in the country during your stay. Or perhaps you're a parent bringing older teens along for the ride-- and you wonder whether they're allowed that small glass of wine at dinner as a special treat. The legal drinking age in Paris and the rest of France is currently 18. This means that individuals over the age of 18 may legally purchase alcohol in supermarkets or other points of retail around the country, as well as in restaurants, bars and clubs. Are you surprised that the age limit is so high? You're not alone: many people have the misconception that France's drinking restrictions are more lax when compared with others in the Western, developed world. In reality, the legal age was upped from 16 to 18 in 2009, with the successful passage of a new law designed to protect younger citizens. The legislation was drafted in an effort to align France's laws with most other European countries, and in a bid to curb drinking among adolescents in particular. This, of course, counters the reigning perception that sees France as a culture that's lax about minors drinking-- a stereotype about locals that has in the past had some basis in truth. Those days are clearly gone, however. Under the new legislation, penalties have also been significantly strengthened: vendors in stores, bars, or other establishments selling alcohol to individuals under 18 may be fined up to 7,500 Euros for breaking the rules. If there's anything that's likely to fight cavalier attitudes about selling or giving alcohol to minors, it's those sorts of potential monetary consequences. How Common is Carding in Bars, Clubs, and Restaurants in Paris? Contrary to vendors in the United States, counterparts in France and Paris rarely require customers purchasing alcohol to show IDs, instead relying on subjective judgement to assess whether a customer is old enough to purchase alcohol. Parents traveling with children or teens from places like North America should be aware that in France, where alcohol consumption is not as stigmatized, it is still relatively easy for younger customers to procure alcoholic beverages. This is why it's probably a good idea to supervise your teens a bit more closely if you're at all concerned. In short: maybe don't let your teens go out for a night out at a dance club alone, even if teens are allowed in by bouncers. Will Parents Be Punished For Allowing Their Teens a Bit of Wine? The answer is no. In Europe, it's considered acceptable for older teens to taste a bit of wine at dinner, or even to have their own (very) small glass. Of course, this doesn't mean you should allow it if you remain uncomfortable with it: it's simply a cultural difference to be aware of. Servers in restaurants will not bat an eyelid if they observe you letting your 16 or 17-year old taste a sip or two from your wine glass. You should not, however, order a glass for them. You probably won't get into any trouble if you do, but it's best to refrain so as not to put the servers in an uncomfortable position.